This was our after lunch warm up on Wednesday! And the Steal The Bacon Champs! The SharkSwags! They went 2-2! GREAT JOB!!! The Pink Panthers. These girls won the tournament with a 3-1 record! This team was the only team to beat The Pink Panthers! Had a really good last day of camp. I'm going to miss everybody that was there and the coaches. The Tournament! It was FANTASTIC! The ball control was more than we could have imagined! Great job everyone! And i cant wait til you come back!! Hannah Shields (Dan River c/o '15): First Team. There was one STAR division. $50 deposit was due with registration. Balance due by June 1. There was be limited number of spaces available, plus, players from other schools were allowed to attend, so, campers were urged to not procrastinate! Devyn graduated from Ferrum College in 2010, where she made the volleyball team as a walk-on her freshman year! She graduated from George Washington High School in Danville, VA in 2007, where she played volleyball for six years. Devyn is now in graduate school at American University in Washington DC. 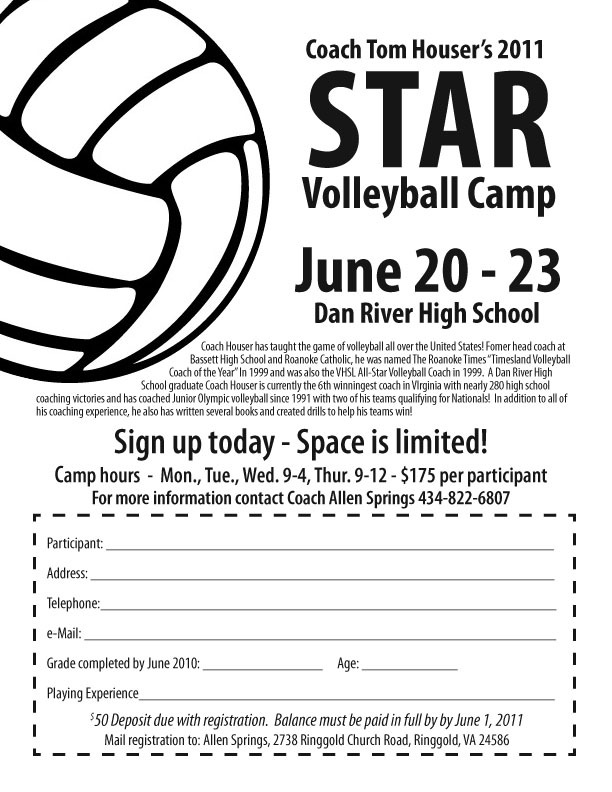 Devyn has now assisted with seventeen STAR volleyball camps, including being the rookie camp director at Chugiak High in Anchorage Alaska in July of 2009 and at Timberlake Camp in July 2010. Her email is: dbayes@ferrum.edu Facebook page is here. Sam has coached on year of JV at Topsail High School, and one year of jrs with the Cape Fear Volleyball Club. She played one year at Shenahdoah University and one year at Cape Fear Community College. She started playing volleyball in the 8th grade, played 3 years of Juniors (one on my 15 Red team here) and 5 years of school ball. She is a 2008 graduate of North Cross School where she played vball. She assisted me with my 2007 Roanoke Juniors 15's team and has now been an assistant at fifteen STAR camps! Her email is: samadamsthomas@gmail.com. Her Facebook page is here. Pictures from the 2010 and 2011 camps are on Facebook!